Whether the bird in questions is a chicken, a turkey, a duck or a goose, the same terminology applies. The drumstick is a firm favourite for barbecuing or frying, either in batter or rolled in bread crumbs. Drumsticks are very good value too. Wings do not supply very much meat, but are ideal and very popular party or finger food. They can be fried, roast or barbecued, with or without a marinade or glaze. The thigh is suitable for casseroling and other slow-cooking methods. Thigh meat has a lot of flavour, and is often the cut recommended for curry or oriental dishes. This comprises of the drumstick and thigh. Large pieces with bones, such as this, are suitable for slow-cooking, such as casseroling or poaching. They can also be roast, and some people use the roast legs to make home made soup or stock. The tender white meat of the breast is the most popular part of the chicken. It is available either on the bone, or as a fillet. Chicken breast can be simply cooked in butter or can be stuffed, coated or wrapped for extra flavour. It is an extremely versatile cut. Not all chickens are equal! It is an often heard complaint that chicken nowadays is dry and tasteless and not a patch on the chicken eaten in the ‘old days’. We don’t hear these complaints in our shop – and there is a very good reason for that. 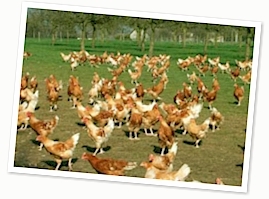 Our Hubbard Ross chickens are free range birds who are reared with meticulous care. These chickens are more like the chickens of old – strong, active, healthy and slow growing. They very different from their intensively reared cousins and live a happier and more traditional life too – they are given plenty of time to grow, are free to move about and fed on a diet of premium wheat. That means not just happier healthier chickens but also superlative flavour and moist succulent meat. You really will taste the difference.